If you need fishing gear and like DIYs, check out these PVC fishing ideas. PVC can be an outdoorsman's best friend. We've already talked about eight PVC hunting projects you can do yourself, and now it's time to take a look at the fishing side of things. Here are 10 PVC fishing projects you can tackle yourself on the cheap and start using today. 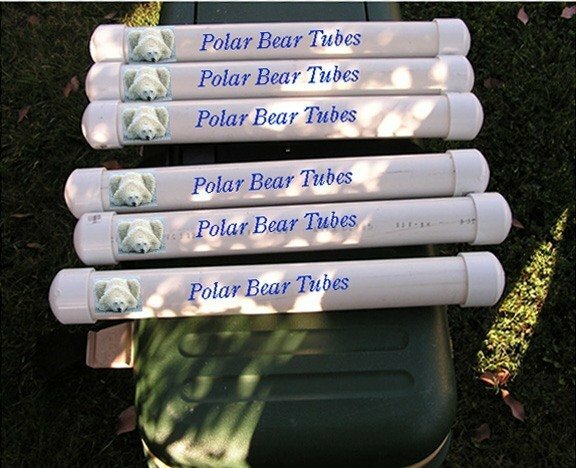 Polar Bear tubes are perfect for keeping your catch cold while not taking up too much space in your cooler. They're cheap and easy to make, and in a pinch, they can be used as a clean source of drinking water. PVC can make a great waterproof storage container. Just get whatever size tube you need to fit your important things inside (cell phone, wallet, fishing license, keys, etc. ), glue an end cap on one side and then attach a threaded screw-on lid to make it watertight but still accessible. PVC pipes can make a quick and easy rod holder for your vehicle. Just attach a few pieces to a board or even to another piece of PVC and attach to the vehicle. A bungee cord will ensure they make the trip successfully. This one actually looks like it could help you catch fish. Use some PVC to create an artificial crappie bed, giving the fish the cover and security they want while at the same time ensuring that you know where the fish are and that your line won't get snagged when you're fishing. PVC is an easy way to create a quick and safe place to store your rods at home. It gets the rods out of the way so there is no danger of breaking them, but still leaves them easily accessible for a quick trip to the river. This is something that you have probably paid way too much for in the past, but now that you know to build one out of PVC you won't make that mistake again. Your catfishing trips will never be the same after you build your own PVC chum-dispenser tube. Tired of everything in your cooler being wet and covered in slimy bloody mess? Use PVC to create a false bottom in your cooler. All the mess goes down below for easy removal and cleaning. Possibly the most well-known fishing use for PVC is the rod holder. You can buy rod holders that do the exact same thing but cost much more, or you can buy one piece of PVC and build a few from it. Just cut the PVC so that one end is straight and the other forms an angle. Drive it into the ground and then sit back and relax. A survival fishing rod can be crafted from PVC. While it does look a little complicated to build, it can give you a serious advantage over just using a line and hook. A DIY kayak cart is a great use of PVC pipes. A kayak cart is something that is very nice to have if you want to go kayak fishing on your own, but they can be super expensive. This PVC kayak cart looks simple to build and will get the job done with a very reasonable price tag. So there you have it. Now you can make your own fishing tools with cheap PVC pipes. Say goodbye to doling out hundreds of dollars at the outdoor store.